Classmate: Kavanaugh "Blatantly Lied" About Drinking - Joe.My.God. 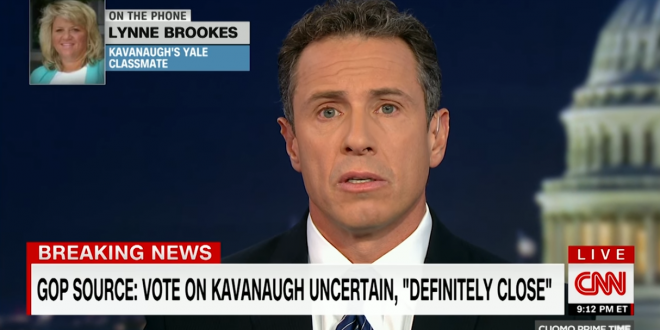 Last night a Yale classmate of Brett Kavanaugh’s called in to Chris Cuomo’s CNN show to say he had “blatantly lied” about his drinking history. “I’ll tell you, Chris, I watched the whole hearing, and a number of my Yale colleagues and I were extremely disappointed in Brett Kavanaugh’s characterization of himself and the way that he evaded his excessive drinking question” and “was lying to the Senate Judiciary Committee today,” Lynn Brookes said. “There is no doubt in my mind that while at Yale, he was a big partier, often drank to excess, and there had to be a number of nights where he does not remember.” She said she can “almost guarantee” he doesn’t remember a night she witnessed where he was “stumbling drunk, in a ridiculous costume, saying really dumb things” to pledge a fraternity. Brooks says she is a Republican and that she admires Kavanaugh’s judicial record.